Volleyball is a big Amish sport. I wonder why they don’t try out for the Olympics? I am being really serious. They play a lot of volleyball. Every Sunday afternoon around 4pm youth groups all around Lancaster county get together. There are many youth groups, they each have a nickname and have about 80 – 100 kids over the age of 16 as members. The parents and kids choose the group they would like to belong to. Some are more strict and some are a little less supervised and the kids run a little more wild. Nancy does not belong to one of those groups. They join the group and their social life is now revolves around these kids and the rules of the group. They arrive by horse and buggy. They set up the volleyball nets. They play until about 6:00 and then they come in for dinner. There is alot of food but those Amish boys can eat. Anna made 200 deviled eggs and they were gone in about 10 minutes. 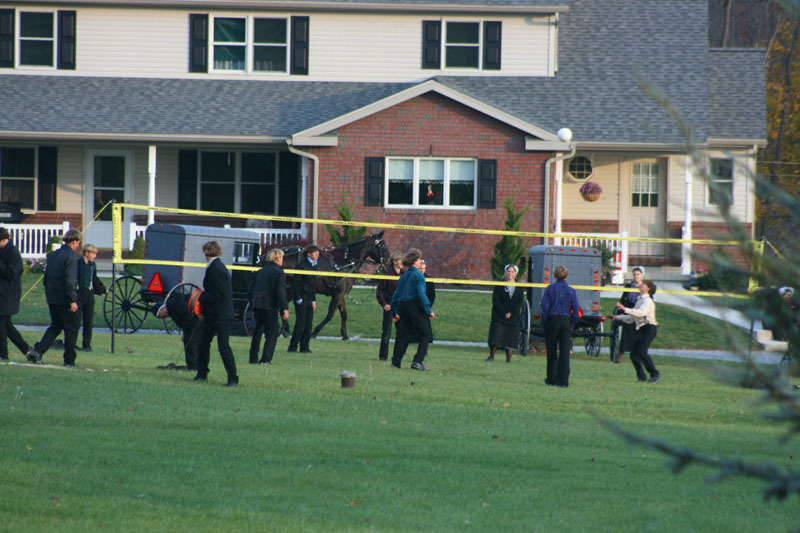 Every Amish home has a basement or set of front rooms large enough to hold all the members of their church district. A church district is usually about 80 – 100 people. A youth group is usually about the same size, although they are from all different church districts. Youth groups are where the young adults get to hang out – and meet other kids. At 7:30pm they have a hymn sing. They all sit on benches with hymnal books and sing for and hour and a half. Then they go back out and play volleyball until about 11pm. They hook up lights to a car battery so that they can see. Clever! I went last week to Nancy’s group which was held across the street. The younger sister of my neighbor is in Nancy’s youth group and Anna offered to hold it at her house. I was the only ” English” there. I felt a little out of place but knew enough of the kids and neighbors to feel comfortable. They sang in German so I didn’t understand the words but they all sang in unison. It was really quite lovely. Someone just starts to sign a song and they rest follow. There is no “play list”. There are about 5 adults from the youth group council to oversee things as well as the family hosting the party and some of their friends and neighbors. Nancy asked me if I had seen a few of the younger boys (only 16 years old and new to the group) -acting up during the singing. She told me that they couldn’t come the next week because they misbehaved. I think they got the message. I must say that overall it is very relaxed in that you can get to go the the bathroom or get a glass of water and the little kids are roaming around. As the kids grow up and start to pair off with boyfriends and girlfriends they tend to behave a bit more. Once they become engaged – which is not a word they they use. They call it published – in that they announce at church they they will be married. Anyway – once that occurs they no longer come to the youth group. They are now considered part of the married culture. I thought it was a really nice, wholesome and a safe friendly environment. They always have a place to go – with all the same kids. but there are enough of them so they can find their own buddy group within the larger group. They do all sorts of things together, go to Hershey Park, bowling, even to the shore. I wish our kids had something like this. They wouldn’t feel so disconnected with each other. They would belong to something bigger them themselves. They would have fin but boundaries. hey would always know they had weekend plans. They are on their own to get to each location and although supervised they learn how to engage socially with friend, parents and adults. I think it is a great idea.